Our society is drawn to individuals and organizations who are able to achieve high levels of success. I have to admit that I am a person who falls into this category as well. As an athlete, I was always searching for ways to gain an advantage so I could reach a peak level of performance. However, as I have grown as a leader, I have become far more interested in learning about unique individuals who have the ability to get the most out of the people that they are working with in a group environment. Naturally, as a former athlete, this has led me to studying the philosophies of some of the all-time coaching “greats” in college sport (see suggested books: John Wooden [Wooden on Leadership], Dean Smith [The Carolina Way]). As I have read these books (and many others), I have learned that a leader’s vision serves as the foundation for success in all elite sport organizations. My hope is that I can provide some clarity on the steps that are necessary for leaders (administrators, coaches, and marketers) to build a solid organizational culture for their program. I believe that this is an important step for building the brand of your organization and/or program. 1. Contemplate a Specific Program Vision: One of the first steps that all leaders should consider when attempting to build their brand is to take the time to establish a vision for the program. In simple terms, this means sitting down as a staff to determine exactly what the organization would like to achieve in the long-run. For coach Wooden, this meant creating a vision of UCLA being the premier college basketball program far before they were at a competitive level. It was his vision that set the tone for UCLA becoming one of the greatest teams in the history of college athletics. There must be a program dream that guides the decisions of the staff on a year-to-year basis. 2. Establish a Themed Program Mission: If a vision is a “program’s dream,” then a mission statement is an organized outline on how an organization will achieve established greatness on a regular basis. While mission statements can take a variety of different formats, the most important thing for leaders to understand is that they have the potential to guide (and inspire) staff members and student-athletes each day when implemented properly. For this to occur, administrators and coaches must first clearly identify the concepts that they want their program members to embrace. In leadership, these concepts are often referred to as core values. As illustrated in the chart below, the “Pyramid of Success” was a themed program mission for the UCLA program. With these values, it is no surprise that his players went on to achieve success in all aspects of life. 3. Invest in Educational Opportunities: One of the biggest mistakes that many organizations make when establishing their culture is that they do not take the time to educate their members on their mission and core values. This is not a mistake that Brian Smith (Head Wrestling Coach at Missouri) is going to make with his program. 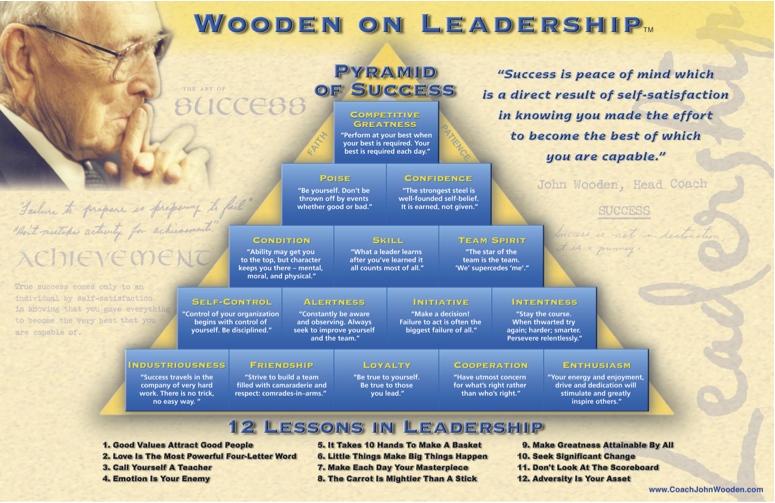 After establishing his “Tiger Style” mantra (see “The Foundation to Branding” entry), he used coach Wooden’s Pyramid of Success as a guide to craft his program’s core values (e.g., Uncommon Accountability, Positive Preparation). However, these efforts would not be effective without the educational opportunities that he has created for his student-athletes. One example here is that he has developed educational sessions to teach his team members about each of the individual core values. This is reinforced with sound reward policies that are explained to student-athletes in pre-season activities. This is the same type of creative process that needs to be embraced within an organization. 4. Reinforce Values on a Daily Basis: The core value developmental and educational elements (steps #2 and #3) are simply the first steps in building your program’s brand. The truth is that your organization’s modeling and follow through will determine whether you are successful in taking your program to the next level. If creativity and innovation is identified as an important brand element, then the “Director of Marketing” in a sport organization must make a commitment to modeling these principles on a daily basis. This is the only way to increase the chances that other staff members will embrace these values. When all members completely buy-in to the philosophy, the end result will be a series of products that send an intentional message about your brand. 5. Incorporate Program Mantra in Innovative Marketing Efforts: In many ways, this final step is the most difficult for organizations to achieve because it clearly involves the ability to practically apply each of the previous steps. Because of this, I believe it is a concept that only highly proactive organizations will embrace. However, it is the type of concept that will take a program to an entirely new level from a marketing standpoint. To describe this step, it is best to discuss the steps that Brian Smith has taken to build consumer interest in his program. 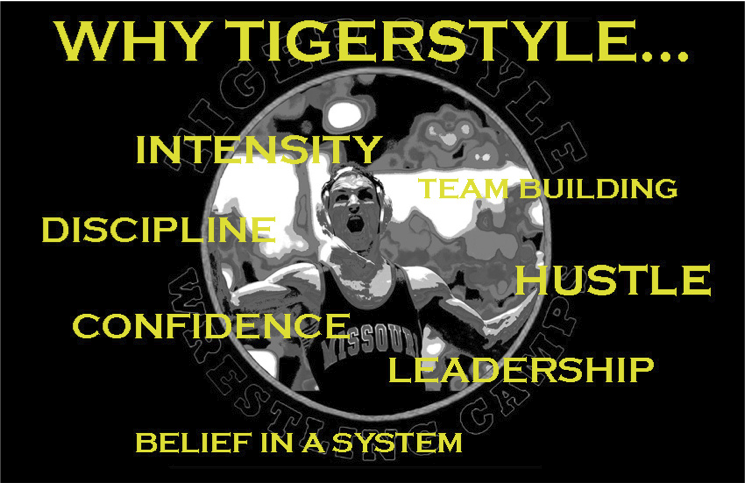 Following up on his “Tiger Style” mantra, he has developed entertainment opportunities such as the “Tiger Style” duals and “Tiger Style” tailgating to further enhance the brand of his program. It is this above and beyond mentality that has allowed him to reach a new level with his program. Coach Smith has done an extraordinary job of packaging his vision for followers. © 2012 NATIONAL WRESTLING COACHES ASSOCIATION. All Rights Reserved.